Wyatt Earp is epic in length and scope, but it never stirs the soul. The detailed story of the legendary lawman is told in a mammoth 3 hours and 10 minutes, and by the end it certainly feels like every significant event in Earp's life has been chronicled, at least according to Hollywood's best imitation of life. But this is a humourless, almost robotic rendition, tipping into territory where the significance of the man appears to be insufficient to justify the attempted grandiose treatment. 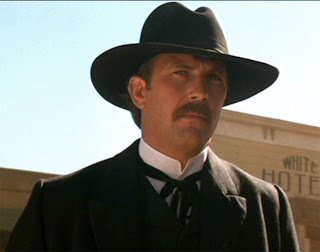 Wyatt Earp (Kevin Costner) and his many brothers are raised in Missouri by a restless father (Gene Hackman), who is always looking for the next move and eternally stressing the importance of family and the law. The young Wyatt works as a wagon driver and fight referee, before courting and marrying Urilla (Annabeth Gish) and appearing to settle down. When the pregnant Urilla contracts typhoid and dies, Wyatt is devastated and he turns to drinking and crime. Bailed out of jail by his father, Wyatt cleans up and works as a buffalo hunter and eventually becomes deputy marshal in Wichita. His good reputation lands him a similar position in the wilder outpost of Dodge City, where he grows in power and wealth and is uncompromising in imposing law and order. Replaced for being too tough, Wyatt travels to Fort Griffin, Texas, where he meets and befriends Doc Holliday (Dennis Quaid), a former dentist, frequent gambler, occasional outlaw, and suffering from severe tuberculosis. Two women also enter Wyatt's life, prostitute Mattie (Mare Winningham) and stage performer Josie (Joanna Going). Another stint in Dodge City follows before the Earps relocate to Tombstone, Arizona. Wyatt and his brothers Virgil and Morgan antagonize the local cattle rustlers known as The Cowboys, including members of the Clanton, Claiborne, and McLaury clans. The escalating tension climaxes with the famous Gunfight at the O.K. Corral, in which the Earp brothers helped by Holliday face off against the Cowboys. The Earps are subsequently targeted with retribution attacks, enraging Wyatt into a violent rampage against all remaining Cowboys. While the relatively much lighter Gunfight At The OK Corral (1957) took great liberties with the legend of the man, Wyatt Earp conveys both the thoroughness and the dryness of reading an encyclopedia, with all the implied pleasures and frustrations. The performances are earnest, the episodes are recounted with respect, the emotions are packaged, the drama is predictable. Director Lawrence Kasdan plays along, with a serious orchestral score too eager to repeatedly flourish, and lush grand vista scenery. Its a film that never lets its hair down, evoking a history teacher who respects his subject too much to animate it. Wyatt Earp is competent and reasonably engaging. But the attempt to faithfully capture the man unfortunately also manages to lose his spirit.